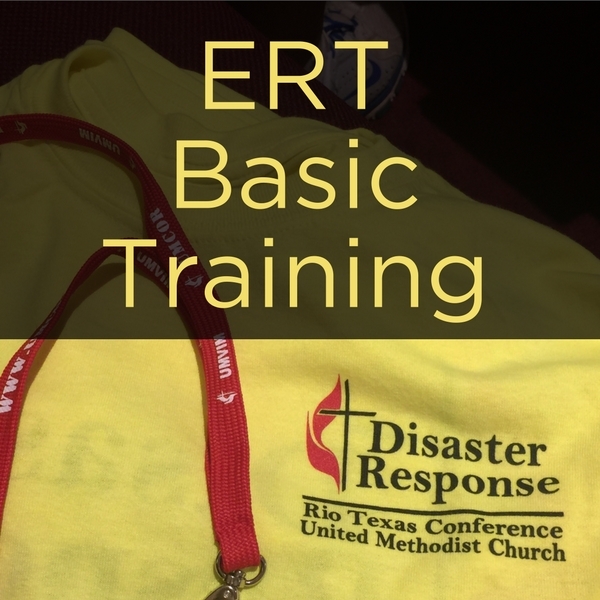 Early Response Teams (ERT) are specially trained teams that offer assistance soon after the disaster strikes. They generally do clean up work and tasks required to stop further damage from being done, e.g. putting tarps on damaged roofs. They might do minor repairs that help make homes habitable, but they do not do extensive repairs or reconstruction (that is the job for Long Term Recovery). All members of an Early Response Team are required to complete the eight hour training course and must have a current background check. The ERT training is done according to UMCOR guidelines and policies. The background check is completed prior to training through Safe Gatherings/Trusted con Confianza training and certification process. As long as your background check is current, you can attend the ERT training. If not, you can complete the training and background check by going HERE before your ERT class. Persons completing the training and passing the background check are issued a badge indicating they are approved by the Rio Texas Conference and credentialed by UMCOR for three years. An Early Response Team has a very narrow function and has no management or administrative responsibility for the overall disaster response. An “Early Response Team” should not be confused with a Disaster Recovery Team. An Early Response Team is a specially trained and certified team called to do early response. A Disaster Recovery Team is a type of UMVIM Team that comes to assist in the long term recovery, AFTER early response is completed. Each Early Response Team member must be trained and carry an identification badge reissued by UMCOR following successful completion of Early Response Team Training. Training - 8:30 a.m. to 4:30 p.m.
• To provide assistance that will help to prevent further damage to homes and property.